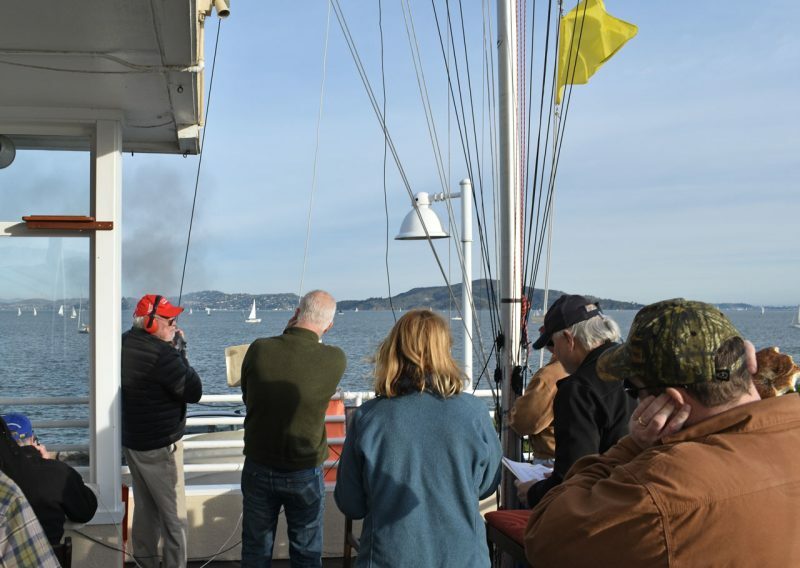 This year’s Three Bridge Fiasco, sailed on San Francisco Bay on Saturday, January 26, was nowhere near the Fiasco it could have been. For instance, during last year’s race a raging ebb sucked most boats out the Gate, and only four entries out of 317 starters were able to finish. 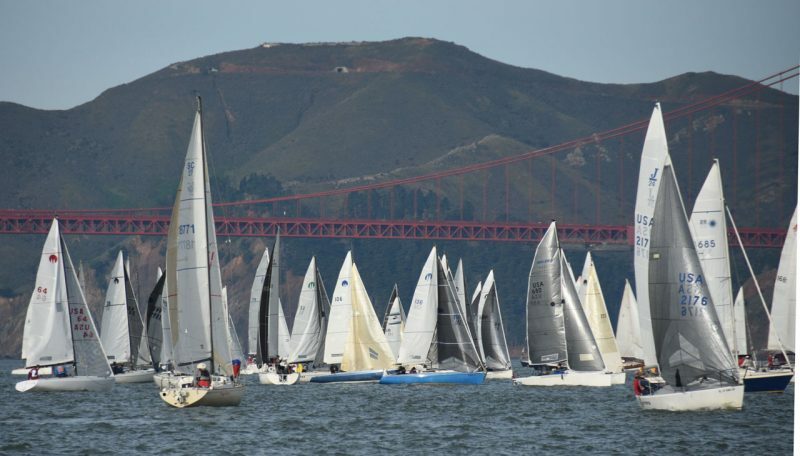 At the opposite end of the spectrum are the years when 100 boats will squeeze through the pursuit race’s finish line off Golden Gate Yacht Club at the same time, from different directions. That can lead to long delays in sorting out and posting results, irritating the competitors eager for instant gratification in the Internet age. Cover your ears! One SSS volunteer fired the first gun at 9:50, signaling a 10-minute warning for the first start, while another volunteer hoisted the yellow flag (formerly a ‘shape’). Richard vonEhrenkrook and Rachel Porter nail the first start on the Cal 20 Can O’Whoopass. The Yankee Dolphin Old School and Cal 20 Slainte were more conservative. 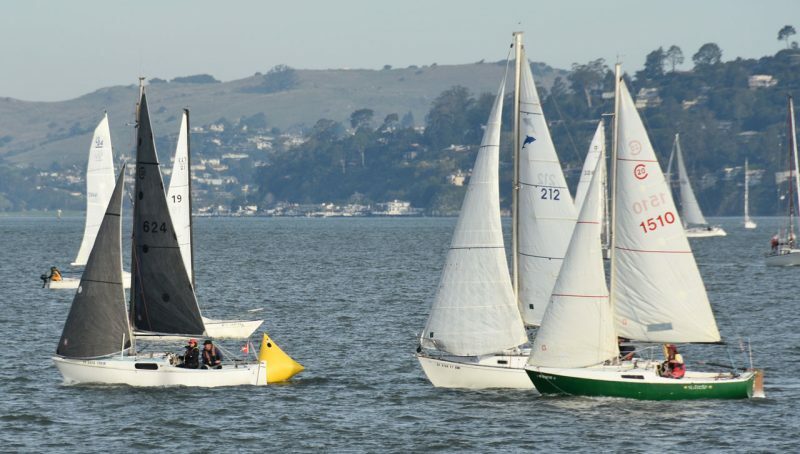 GGYC replaced their starting buoy X with a yellow inflatable mark. The race did prove to be a fiasco for that one boat. 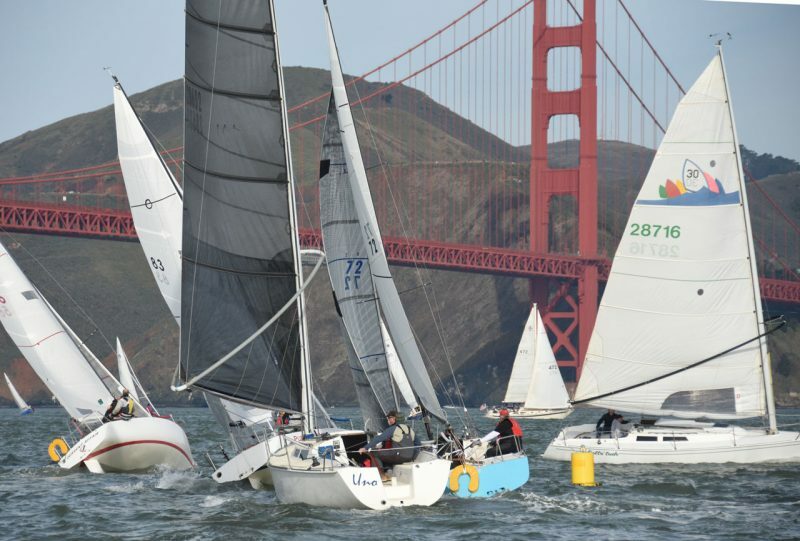 Adam Spiegel / Ben Pedrick on the J/105 Jam Session had rounded Blackaller Buoy (the Golden Gate Bridge mark) to starboard and headed up toward Red Rock (the Richmond-San Rafael Bridge mark), when they collided with what they believe was a whale that broke their rudder. Other racers had sighted the whale earlier in the waters between the Golden Gate Bridge and Alcatraz. “I saw a whale in the Bay on the way to the start line, in the vicinity of Harding Rock around 9:10 a.m.,” Bruce Munro advised the SSS. Bruce and Mark D’Arcy were sailing the Sabre 402 Princess. “Having a race boat wiped out by a whale is a first for any regatta on the Bay that I know about.” A RIB sped out from the marina to go to the aid of the damaged boat. The racers had plenty of northerly breeze on the Cityfront for a fast reach to Blackaller. The ebb gave them a boost of extra SOG. The counterclockwise Bay Bridge rounding. 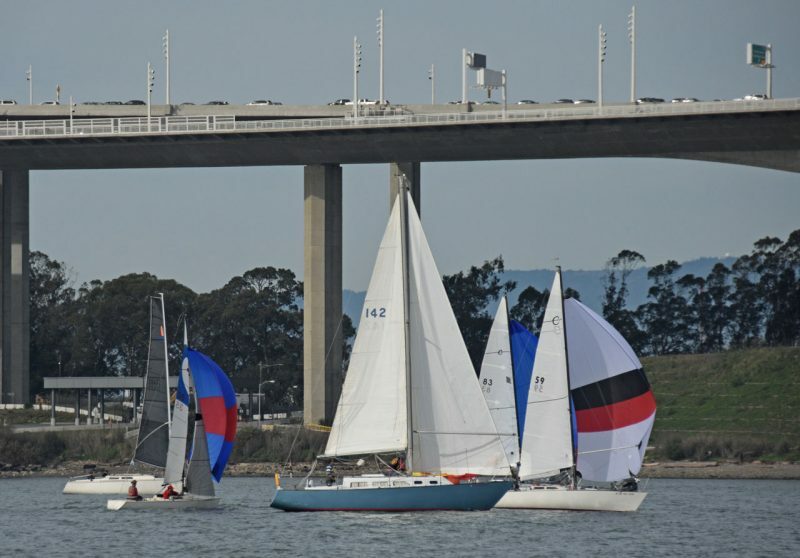 The Bay Bridge is the only one of the three bridges the course actually rounds, sailing under both spans. “Our finish data is perfect, in that I have time-stamped photos of every boat that agree with both sets of recorder data. The start is a separate issue, with lots of 20-minute penalties accrued for being in the box, starting early, starting early and often in a few cases, and a whole lot of Moore 24s OCS. This will take time to sort out. Maybe by Wednesday this will have all settled out.” In the meantime you can check preliminary results on Jibeset. The Moore 24 start. Most of the 27-boat fleet started west to east, on port, headed toward Treasure Island. The SSS will hand out awards for the top finishers and shirts for all racers at the trophy meeting on Wednesday, February 6. Oakland Yacht Club in Alameda will host the gathering starting at 7:30 p.m. The SSS hopes that everyone will pick up their shirts. We hope that all the division winners will show up to tell their tales of success. And, we’ll want to take pictures of the overall winners for a story in the March issue of Latitude 38. 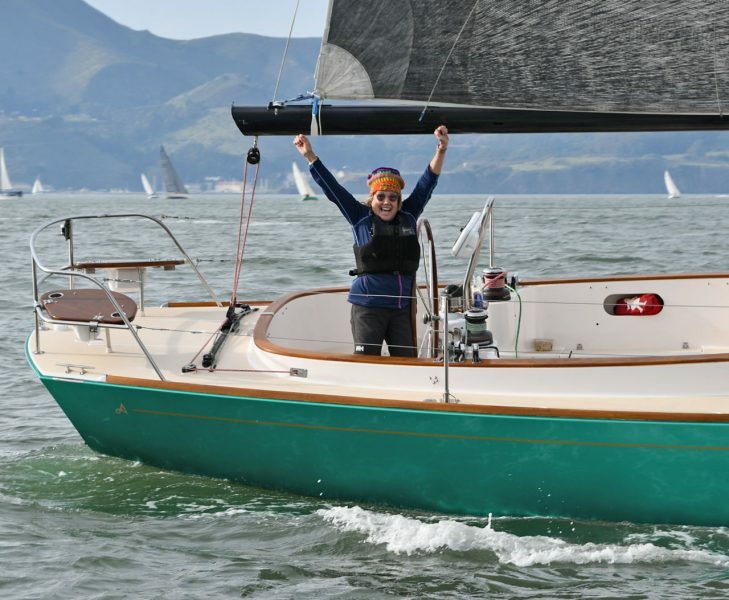 “My first time singlehanded!” Cinde Lou Delmas exclaimed. Her distinctive green Alerion 38 Another Girl is usually seen packed to the gunwales with sailors of all ages. 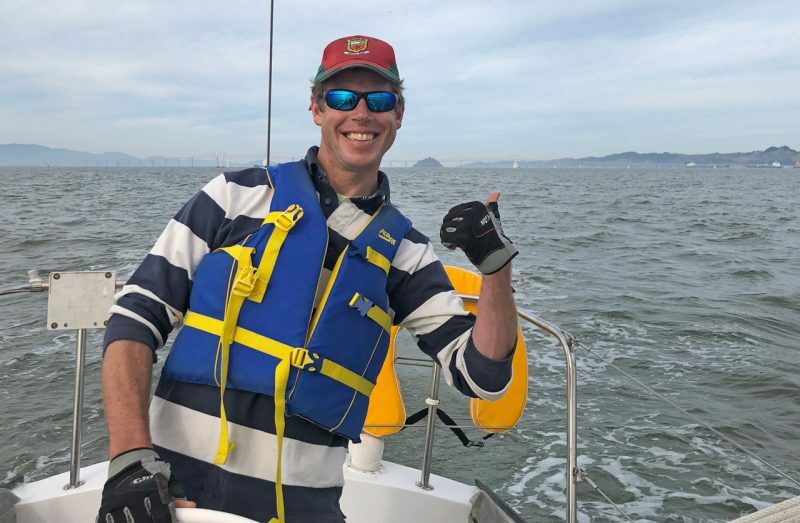 James Dilworth, at the helm of the Ranger 33 Summer Sailstice, appears to be saying, “Third mark, Red Rock, in the rearview mirror; check!” James is the developer of Latitude 38’s new WordPress website, and he also sails the Santana 22 Pip. Latitude Nation — Can you ID this boat? Any guesses . . . ? Help Roger Krakow identify his Mystery 20. There have been many guesses but no matches. It measures 20-ft on deck and has a swing keel and an Odyssey sail. Please either write us below, or email us here. And please be sure to include your Boat Name, Make and Port of Call. It’s always unnerving when going for an evening stroll on the beach and discovering an abandoned sailboat. Is everyone OK? What led to this unfortunate beaching? It’s hard to know, but easy to worry about what might have happened. And also, what happens next? Another boat has washed up on shore this winter, but this time in West Marin. 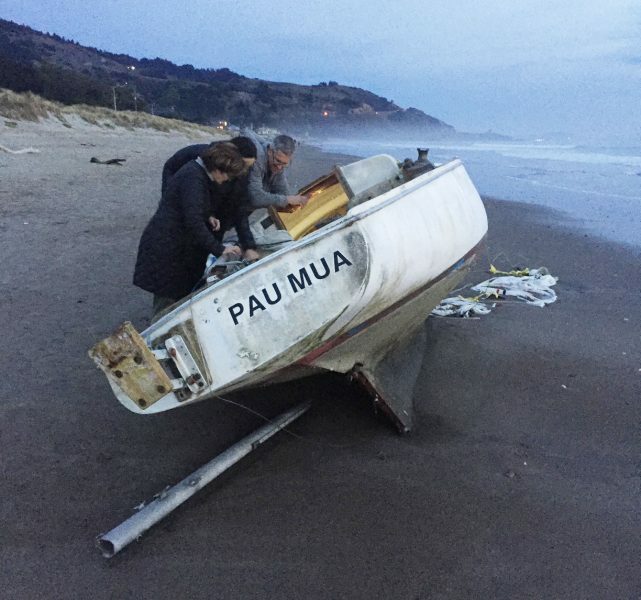 Andy Spiegel and Katie Smith were out for a beach walk Saturday evening on Stinson Beach and came across the Pau Mua looking a bit worse for wear. The mast was off, rudder was missing, and the sails were scattered, though the cabin seemed to still have its contents aboard. There wasn’t much more to indicate what might have happened. We called the Coast Guard — now thankfully getting paid for their work — who said the boat had been reported beached, but had no further details. They are getting in touch with a commercial salvor who will head out to Stinson to figure out what to do with the boat. With winter storms, king tides and other environmental stressors on boats and marine infrastructure, it’s the time of year in which a lot of weak links get shaken loose from their once-secure holdings. Now it’s up to some agency, this time the Coast Guard, to figure out what to do. 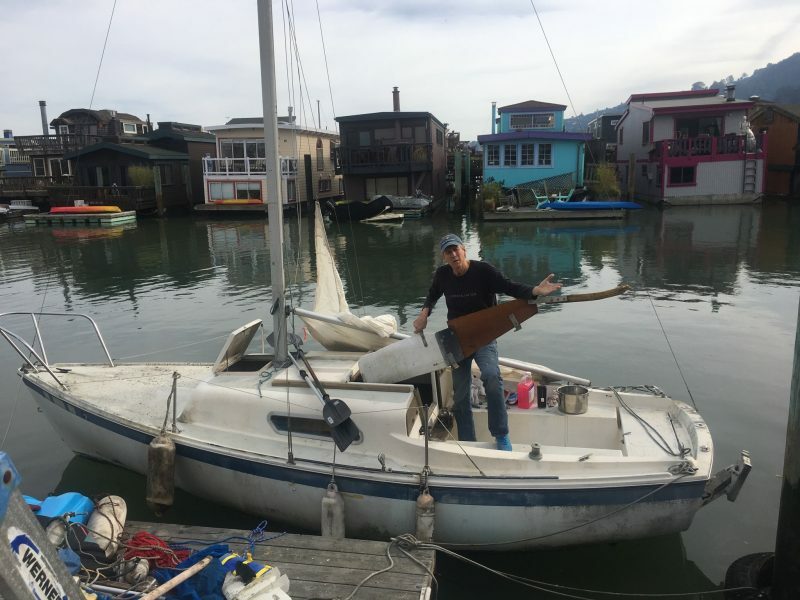 We’ve written recently about the Richardson Bay debate and have a new story in the February issue — coming out Friday — about a boat in Corte Madera that was called marine debris by the authorities, but called fully founded and seaworthy by her owner. Every situation is different and each can be as fickle as the winds we sail.